A roller mower will help you achieve the perfect striped lawn while also assist in flattening any bumps that exist. Below are the reviews of some of the best roller mowers available to buy in the UK. The model is a reliable and an intelligently designed model with a frame comprised of lightweight aluminium which is both robust and manoeuvrable. This maximises the level of control you have over your mowing experience, particularly navigating around garden plant pots and chairs. This is further complimented by the seven different cutting settings that are available for use, ensuring that the user can decide on the type of finish they want with the lawn every time. 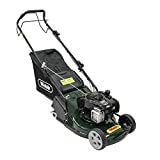 The mower is powered by a 500 series engine designed by Briggs and Stratton, which affords you all the power you need to complete your tasks. An especially pleasing feature of this mower is the generous three-year guarantee that’s been provided to you as standard. This solidifies the manufacturer’s trust and confidence in their product and further highlights that the model is made of high-quality materials. Overall, it is evident to see why this is an attractive and extremely well-designed mower, with all the features it boasts as well as the 55l collection bag to minimise the trips to the waste bin, this mower will definitely earn a spot in your prized collection of tools. The Castelgarden was built with power in mind, and with a 125cc 4 stroke engine courtesy of Briggs and Stratton, it’s clear that there’s power to spare when performing all your mowing tasks, complimented by the self-propulsion system for natural movement of the mower. An intelligent and practical design gives this model the capacity to compete well with other models, as this variant of mower incorporates a steel based cutting deck for improved durability and reliability. Furthermore, the model has multiple cutting heights which range from 20 to 70mm, giving you an increased sense of control over your mower and the finish on your lawn. The model also features ergonomic handlebars, which makes for a comfortable grip during extended usage, as well as folding handles, which make this model ideal for domestic and professional usage due to its portable and transportable nature. Overall, this model is a fantastic example of modern technology and demonstrates how the designs of mowers are progressing and becoming more and more user-friendly and helpful over time, as this variant of the Castlegarden range is readily usable by many different types of people. Overall, this is a mower with an emphasis on longevity and reliability, but thanks to the self-propulsion system and the adjustable speed, power and cutting heights, the model is ideally suited to a broad audience. The mower can be tailored to suit any circumstance, including those elderly gardeners who aren’t ready to stop work yet. 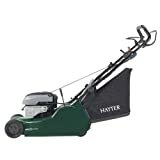 The mower has been designed to perform well in both a professional and a domestic setting, incorporating foldable handles that give the model portable properties. There are ergonomic handles which improve the comfort of the model, and the self-propelled engine ensures that anyone can operate the machine with ease, regardless of physical capability. The mower was designed to be sturdy and long-lasting, featuring a thermoplastic decking that’s been rigorously tested for strength, and the multiple adjusting grass cut heights ensure that you can always have the perfect finish on your lawn. There’s also a 55l collection bag to collect a generous amount of waste before needing to stop and use the waste bin. This is a fantastic piece of technology, well designed and built to be a welcome addition to anyone’s gardening supplies. The heavier construction is countered by the high levels of durability, which is a positive trade off, highlighting the mower’s ability to tackle tougher tasks. The two-year warranty is evidence of the fact that the manufacturers place a high level of trust and confidence in the design of this high-quality machine.